New Finds - This are the most recent items just added to our collection! 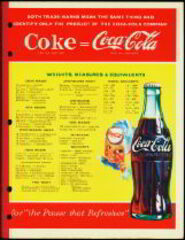 Vintage circa 1950 Coca Cola Sprite Boy School tablet. This is not a real common one. It has the Sprite Boy pictured like on the ABC tablets, but has weights and measures on it instead. Inside cover has "Safety First" info. These are really nice unused tablets that came out of an old Coke plant down south. This kind of stuff doesn't come around that often any more so get them while you can. 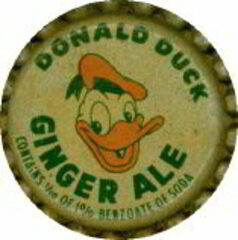 Very rare vintage Donald Duck Ginger Ale Cork Lined Soda Cap. Marked with the Walt Disney Copyright. These are very early. A fellow down in Georgia got them out of an old soda plant. They were in a wooden (that's right, wooden!) crate. They have an older very thick style cork. They are from around 1940 or possible slightly earlier. Unused condition. They do show some minor darkening from age (the picture is typical), but are in great condition and the best I've ever seen for ones this old. You get 10 for $9.99 (that's 99¢ each). These are vintage unused stock from around 1960. The older heavy hard plastic type. They were made in sealed packages of 10 and so have kept in very good condition. 2 5/8" wide. This is a great price on these. These came from a former employee. Eastern Airlines was considered one of the "Big Four" airlines for nearly 50 years till they hit bankrupcy. Kind of like General Motors current situation except they never recovered. You get the set of 3 different for 1.99 (that's 66¢ each). 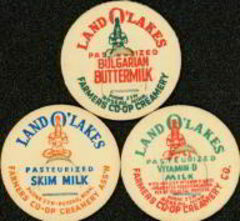 These are very old Land O' Lakes milk bottle caps picturing the sitting Indian. The phone number on them is "phone 23w". Likely from the 1930s or older. One says Bulgarian Buttermilk, another Pasteurized Skim Milk, and the third Pasteurized Vitamin D milk. 1 5/8" diameter. 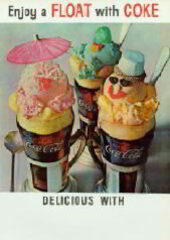 They came from the Farmers Co-op Creamery in Roseau, MN, are marked as such, and are in excellent unused condition. This is a very scarce cap.